In 2004, Paragon Media launched Australian Sky & Telescope, a world-class magazine about the science and hobby of astronomy and space exploration. Produced in Sydney, it’s designed specifically for the Southern Hemisphere. We compile our articles from writers both local and international, combining our experienced editorial and production team with the formidable resources of Sky & Telescope in the United States. That gives us in Australia an unparalleled informed perspective on the global field of astronomy and space exploration, while at the same time catering to the interests of our Australian and New Zealand customers. Our customers (readers, advertisers and writers) are very important to us, and we support them. That’s why we’re pleased to be able to offer a locally-produced magazine – one that distinguishes itself in being regular, entertaining, informative, reliable and balanced. We’ve engaged strongly and warmly with our fellow members in the local astronomy community, reporting on key results being announced by professional astronomers and letting amateur astronomers know all about local star parties (extensive reports) and the like. At amateur gatherings around the country, our magazine is fondly regarded. Our astrophotography gallery showcases spectacular images from Australian and New Zealand amateurs. We’re looking forward to this year and beyond, continuing to consistently deliver the latest news and developments, and catering for everyone – from the absolute beginner looking to buy their first telescope, right up to the seasoned observer who wants to expand their collection of equipment and skills. 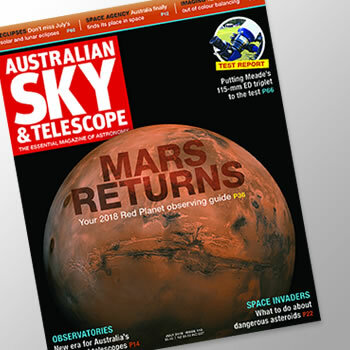 We hope you continue to enjoy reading Australian Sky & Telescope as much as we do.